I wrote the bulk of Adaptive Web Design in early 2010 while taking a much-needed break from client projects. I had originally slated for it to be released just before the holidays that year, but life happened and the book did not make it out into the world until mid-2011. Six months is a long time in the technical world, and especially on the Web. A year is forever. 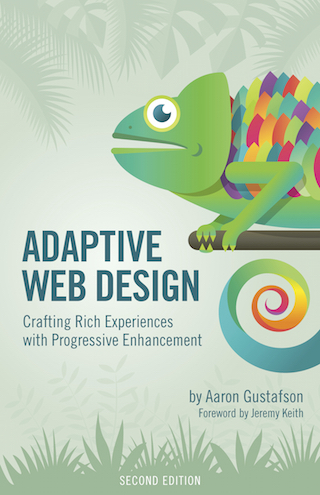 Thankfully, Adaptive Web Design was never meant to be a technique book. As web design books go, technique books have perhaps the shortest lifespan. Heck, some are even out of date before they come off the press. Rather than going down that road, I consciously positioned my book as a web design philosophy book—the code samples were merely there to demonstrate how the philosophy could be applied to your work. That simple choice is probably why Adaptive Web Design continued to have strong sales year-after-year and it’s the reason that book continues to rank highly on many recommended reading lists. I finished writing the Second Edition about a month and a half ago and have read and re-read it several times since then. I’m quite happy with the end result and I hope you will be too. I plan to get some of the content out there for you to read before deciding whether to purchase it, but in the meantime you can read more about it on the updated book site. I also encourage you to check out Jeremy Keith’s amazing Foreword—which, admittedly, made me a little misty—and the sweet things Ethan and Tim Kadlec had to say about the book after reading it. @AaronGustafson didn’t realize there was a second edition—will certainly check it out - thanks! nice. i’ll do the same later this week. I’m behind on so many promising reads.